The benefits of regular wood deck maintenance are well worth the time and cost. Regularly cleaning and protecting your deck with a wood stain or sealer is one of the best things you can do to guarantee years of use. The proper procedure for regular wood maintenance is to clean or prep the wood prior to applying a wood deck stain. The purpose of cleaning the wood it so the new deck stain will penetrate or adhere properly and perform as promised. To establish whether you will need to use RAD deck cleaner or RAD deck stripper you first have to determine what is on the wood surface that needs to be removed. 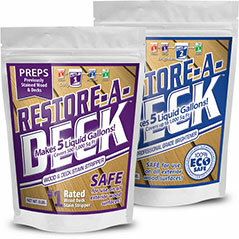 Restore A Deck cleaners come in a powder form and contain sodium percarbonate along with other additives that boost the overall effectiveness dramatically. 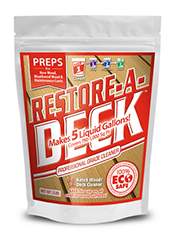 RAD deck cleaners will remove contaminants such as dirt, grime, graying, mold, mildew, algae, and mill glaze. They break down these unwanted soils making it easier to scrub or pressure wash the wood to a newly restored surface ready for stain. 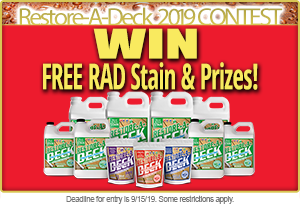 RAD wood deck cleaners are designed to clean wood that is grayed and dirty and has little to no existing deck stain present. If you are unsure if your deck has old stain or sealer on it splash some water on the surface. If the water beads up there are some remnants of old sealer or stain, if it absorbs into the wood quickly there is little or no sealer. If it is obvious that a deck has an old failing stain or sealer on it, or if water beads up then it may be necessary to use a deck stain stripper as opposed to a deck cleaner. 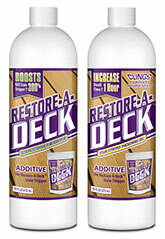 Restore-A-Deck strippers contain more aggressive caustics than deck cleaners. 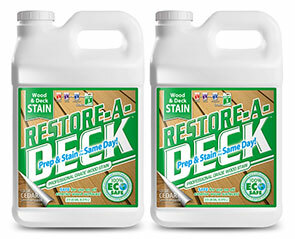 Unlike a cleaner, a wood stain stripper will emulsify and breakdown most water and oil based transparent, semi-transparent and semi-solid deck stains so they can be washed off more easily. At the same time dirt, mold, mildew, and all other contaminants are also removed from the wood surface along with the failing deck stain. It isn't necessary to use both a deck stripper and a deck cleaner during the same washing process. Determine what is on the surface of your wood deck and then decide whether you need a deck cleaner or stripper. 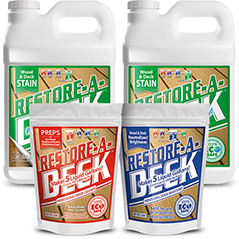 Note that once the wood is cleaned or stripped you need to follow up with an application of the Restore-A-Deck wood brightener. 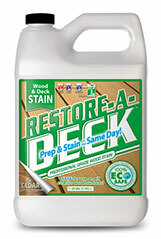 This restores the wood's pH balance for better stain penetration and enhances the beauty of the wood. It is a necessary step after deck cleaning or stripping. Thank you. Yes, I do want to strip off any of the coating that came on the boards before applying a protective stain to the entire porch. There is very little gray oxidation, since the porch is only a few months old. Can I be confident that the RAD Stripper plus Brightener will not remove the natural pigment in the mahogany boards, but will only prep the boards for stain? Thanks again. It does prep the wood for restaining. The natural wood pigment fades over time though and when you remove oxidized wood cells, you are basically removing a layer of wood so if the color of the wood is lighter after the prep, it is not due to the RAD products but the wood fading. It will strip it and remove the gray oxidation. We have new mahogany porch boards (about 6 mos. old), partially under cover and partially exposed to the sun and rain. The wood came with a protective "glaze" that initially repelled water but now has weathered off in some parts but not others, so the entire floor probably has to be stripped before stain/UV protection is applied. 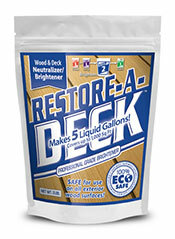 Would the Restore-A-Deck Stripper and Brightener "bleach" the color out of the wood? I used the cleaner and the brightener. Then, the weather turned cold, then wet, then cold, then wet again. It will have been 3 weeks since I brightened the deck - can I still use the Armstrong Clark transparent stain? Do I need to re-brighten first? You should rebrighten since it has been 3 weeks since the prep was done. If you don't recommend your products for regular clean - only prep, do you have a product that you do recommend for regular maintenance cleaning? We do not. You want something that is not too aggressive to the point that it will remove the coating. I used RAD step 1 and 2 last year on my newly constructed pressure treated wood deck. I then stained with an Armstrong Clark semitransparent stain. This spring, I would like to clean the deck as there are some stains on it. Do I still use both step 1 and 2, or just step 1? Will the brightener hurt my existing stain? Our cleaning products are prepping products for retaining. I would not suggest using them for just cleaning unless you want to reapply the AC. They will remove some of the stain. I have cleaned my deck with a pressure cleaner and it has left trail marks when I sprayed close to the deck and they are obvious. Could you please advise me of what do I do with this problem before I apply stain. I have scrubbed using deck cleaner with a scrubbing brush. You cannot fix the pressure washing marks with a cleaner, brightener or stain stripper. You would have to sand the entire floor "evenly" to remove them. Use 60 grit paper. After you should use the RAD kits for the final prep before staining. It appears that RAD Stripper is not suitable for stripping solid oil-based stain from my (pressure treated pine) deck. The stain in some parts of the deck surface is mostly gone (appears black from dirt, mold, mildew) while other deck sections are just faded solid stain (and mold/mildew). What product is recommended? No deck stain stripper will remove a solid stain easily or effectively. I will be using Armstrong semi-transparent oil based stain. Currently the desk has a semi-transparent stain. The deck is in good condition. It does have green/mold spots and sections where there is very little or no stain left. Will I just need to use Deck Stain Stripper? That and the wood brightener to neutralize after. Around the wood screws there is a dark bleeding on the cedar wood, Step 2 was applied about less than 5 days ago I am planning to reapply step 2 you can see different shades in the cedar. restoring the deck I can only work on it for about 3 hours physically. is there something different i should know about for the bleeding around the wood screws? The is rust from your screws. The brightener may remove the black rust stains but it will come back once rain rusts your screws again. The RAD does strip of oil based semi-transparent stain but it may have an issue when trying to remove 4-5 layers that have been over applied through the years. You may need to strip a few times to get it all off and even sand some stubborn areas. Once removed you need to use the RAD brightener for the final prep. Either the 100 or 1500 Series. Hi, Stripping my deck and Gazebo is going to be a multi-day project. Can I strip it entirely then go back later, re-wet and then use the brightener? You can but it is always best to brighten as soon as possible. I have a new Brazilian Redwood deck that was treated initially with a SSW Deckscapes stain. A matter of weeks later the surface looked gray and terrible. I've power washed the deck, but it hasn't made much of an impact, if any. I tried treating a small area with the RAD cleaner/brightener and it doesn't appear to have had any impact so I'm considering using a stripper/brightener, but I don't want to ruin the wood with harsh chemicals before putting on TWP. Is there a better path, such as just letting it weather for several months, or trying different methods? Seems your options are either strip and brighten or sand it all off. It does not just weather away. For two months . Now I have to sand and stripp. Going back with twp. Hope this is better. I accidently ordered the cleaner and brightener kit. I needed the stripper and brightner. How do I go about returning the cleaner for a refund? The cleaner has not been opened. Kyle, you would have to return the whole kit as the stripper does not come in a kit. You cannot just exchange the cleaner of a stripper. Please call to discuss. We first power washed the deck which removed most of the deck stain on the surface however there is still quite a bit that needs to be removed from the sides. This is not a typical deck with post and spindles, This is a low deck with 2 steps. the sides are actually benches and there is decorative wood holding the benches. There are alot of crevices and angles that need to be stripped. After power washing, we got a sander (hand) using a 60 grit paper,This didn't remove anything. We haven't tried the belt sander but i'm concerned that it won't remove it either. Any other suggestions? I've been reading about strippers but I see there are mixed reviews. We want to put a semi stain on the deck. Out stripper will not remove a solid stain. It may help some but it will not get it all off. My deck has paint on it that has peeled in many spots and I want to completely remove the paint. Will the RAD stripper work or do I need a different product? No deck stripper will remove paint. You will need to sand it off.